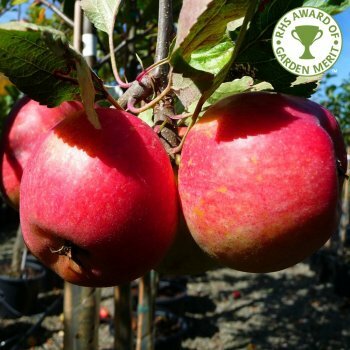 Suited to Northern areas and less-ideal sites, this apple tree, Kidds Orange Red, produces an attractive apple with aromatic, sugared cox-like flavour. The honeyed juices from white flesh, beneath flushed skin makes this apple tree a popular choice. For the best results Kidds Orange Red Apple Tree requires a pollinator in group A, B or C within a half mile radius. Kidds Orange Red is in pollination group B and thus requires a suitable pollinator within a half mile radius. Apple trees should be spaced according to their rootstock, for example an MM106 (semi-vigorous) rootstock will require approx. 4.5 metres between trees, whereas an M27 (very dwarf) rootstock will require approx. 1.5 metres between trees.